The First Step is a Quest in Fallout 4. 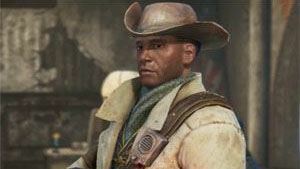 This quest starts if you accept Preston Garvey's invitation to join the Minutemen. He tells you that for the Minutemen to return to their former glory, you will need to recruit more people to join up and by doing that, you're going to need to help people out. The first job is to help the settlers at Tenpines Bluff with a raider problem they're having. Travel East towards Tenpines Bluff and talk to the highlighted settler who will tell you that a group of raiders holed up at the Corvega Assembly Plant are giving them problems. Your task is to kill them all. A fair warning, the Corvega plant is teeming with enemies so you will need plenty of ammo, healing items and ideally a companion who can hold their own in a fight. Power Armor would also make things significantly easier if you're struggling. Head south from Tenpines Bluff towards the waypoint marker. You'll encounter a handful of new locations on the way and more than likely run into a few groups of marauding Ghouls. When you reach the Corvega Plant, be aware of the Mk 1 Machine Gun Turret at the front of the building and a handful of raiders hanging around outside. Clear these out then you can enter the plant. You can go in the front door or via a door on the 1st floor after climing some stairs. Once inside, work your way through the plant slowly, making use of cover and taking on each Raider one at a time. It's very easy to become overwhelmed by the sheer numbers of Raiders in the building. There are two turrets on the ground floor of the building too, so be careful. Once you have cleared out the factory floor and the upper gantries, head outside via either exit on the 1st floor to reach the roof. Treat the roof the same way, take things slowly and deal with each enemy one at a time. There are significantly more raiders on the roof than in the building, so take your time. At the highest point of the gantries, on the west side of the building make sure to pick up the Repair Bobblehead. Once you've cleared the factory floor and the roof, you'll notice that the quest isn't complete yet. There are still raiders in the rear of the plant. Head back down to the ground floor, go into the door next to where the first machine gun turret is found and look to the left. The staircase up is very easy to miss but the last dregs are located up here. Head up and be wary, there are two raiders, a boss raider (carrying a minigun) and two machine gun turrets. Deal with the group as you will and the quest will be complete. Head back to the quest giver in Tenpines Bluff, then back to Preston in Sanctuary to complete the quest. I accidently sold my flare gun and I cant find it anywhere! Where can I find it?